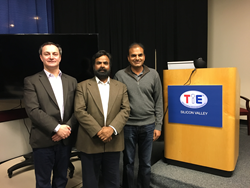 About TiE Silicon Valley: TiE Silicon Valley hosts nearly 50 events yearly which promote entrepreneurship in the Bay Area and globally. Providing networking, education, and mentoring, the not-for-profit organization inspires entrepreneurs. The company's relevant events bring the community of professionals and startup employees together to learn from local leaders, as well as each other. TiE SV also supports startups with their incubating programs and organizes angel funding for entrepreneurs. Learn more at http://sv.tie.org/. About Automaton: Founded in the Silicon Valley, Atomiton is a technology company, which strives to develop the next generation of IoT applications. As a ground breaker in the industry, the company's team has founded the Industrial Internet, created platforms and businesses, and invented software languages. Visit http://www.atomiton.com/ for more information.